This yacht is priced from €950 per week in Croatia during October. More details about the Bavaria 44 are available on the Bavaria website. 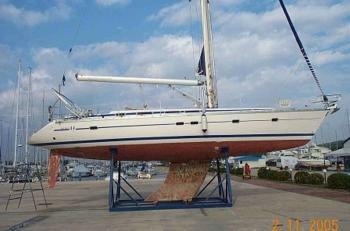 The Bavaria 44 was only built for two years before (2002-2004) evolving into the new Bavaria 46. This is hardly surprising because the 44 is nearly 46 feet in length. The yacht very popular with charter companies, with over a hundred companies having this model on their books, because most variants have four spacious cabins. Please note that the details and photos shown for the Bavaria 44 are general examples only. The specifications of yachts (including the number of berths, cabins and heads) varies so please confirm the details when booking with your yacht charter company.